We cooked a roster of Pinoy favorites, such as menudo and lumpiang shanghai for our dad’s birthday. Since we only had a few relatives over to celebrate, we had some leftovers for the next couple of days. I even got to bring some “take out” back to my dorm. We can’t cook at our dorm, so my trusty microwave has been getting all the work to reheat my meals. Good thing I just bought a cute Angry Mama microwave cleaner just in time for all the leftover from my dad’s birthday. A friend recommended this to me when my microwave started to smell. She said she bought hers from MetroDeal, so I checked and bought one, too. It’s effortless to use. I just put a mix of water and vinegar or lemon juice in Angry Mama’s head. Then I leave it inside the microwave on high for a couple of minutes. The steam softens dirt and stains, which makes it easy to wipe clean. At the same time, it’s great for neutralizing food odors inside the microwave! It’s very convenient and makes cleaning the microwave a breeze. I’ll definitely recommend this to friends and buy one for our home. 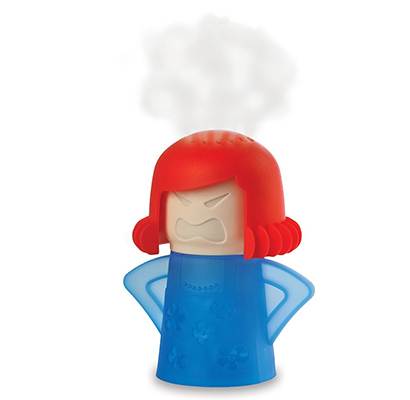 My mom will surely love this cute Angry Mama!